uso dattara mou ko hantsukun nai! konna totsuzen owatte shimau no? doushite konna ni akke naku owatte shimau no? ne, ne, kawaii hito tte itte! mou yasashii to ka ii hito da toka wa iyana no! isshou anata dake no kawaii hito ni naritai! demo kawaii hito ni natte suggoi anata no koto taisetsu ni shimakuri dakara! mini no kirakira sukaato de utatte iru kara! anata dake no, isshou anata dake no kawaii hito ni shite! obaachan ni natte mo suggoi anata no koto taisetsu ni shimakuri dakara! mini no kirakira sukaato de dokidoki sasete ageru kara! watashi dake no kawaii hito tte anata wo yon de ageru kara! nagu samete moshi kureru nara oshiete dou shitara ii no? ryouhou aru kara ii no kana? docchi mo kurushi itoshite anata nara ne, dou suru? Miwa’s second solo album! Many from the original beauty and harmony all star band return and bring a number of their talented friends with them. In addition to this regular version, a special, limited edition (beautiful) purple jewel case version of the album was released. 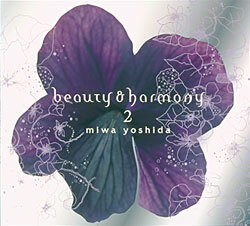 Miwa also released a single called Namida no Mangekyo in conjunction with the release of the album. There was also a five city beauty & harmony 2 tour which started the same day as the CD release. A reissued limited edition contained a DVD of the beauty & harmony 2 tour.